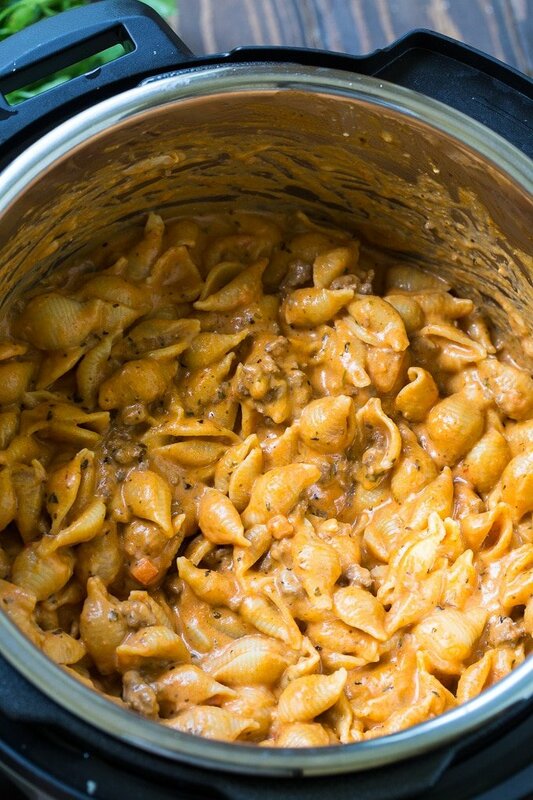 Instant Pot Creamy Shells and Beef is pure comfort food. This easy Instant Pot dinner recipe is so creamy and cheesy. 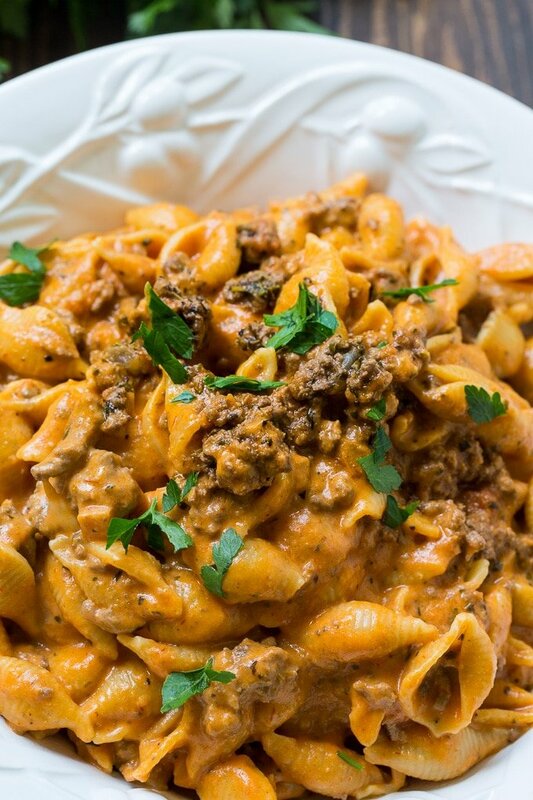 Pasta shells and ground beef are cooked in a tomato sauce and then Parmesan cheese, cream, and cream cheese get mixed in. 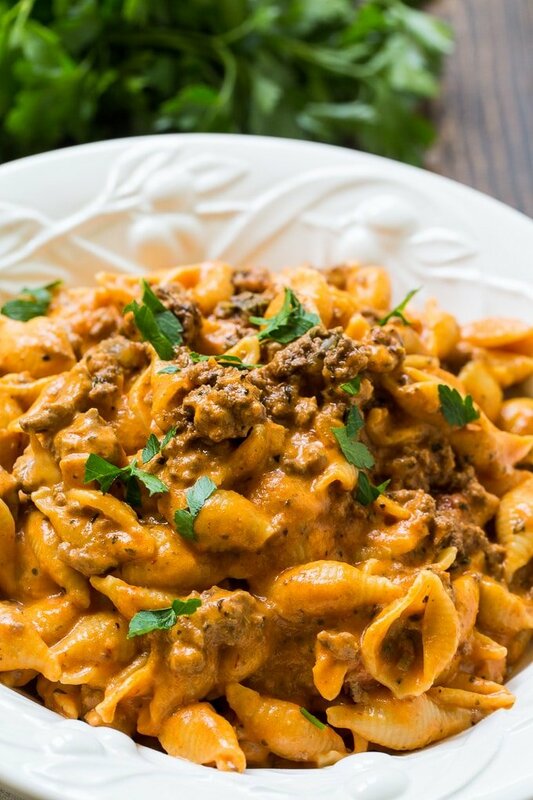 Instant Pot Creamy Shells and Beef is a little like homemade Hamburger Helper, only much, much better. To make Instant Pot Creamy Shells and Beef, first use the saute mode to cook a pound of lean ground beef and a chopped onion. Then add your flavors- dried Italian seasoning, garlic powder, salt, pepper, and crushed red pepper flakes plus a tablespoon of tomato paste. Once the ground beef is no longer pink, pour the uncooked pasta shells on top. Pour a jar of spaghetti sauce and 3 cups of water over the shells. Press the shells down into the liquid, but do not stir. Pressure cook on high for 5 minutes. The pasta soaks up so much flavor cooking this way rather than just being boiled in water and then mixed into sauce. After pressure cooking, do a manual release. Stir in 1 cup of Parmesan cheese, 1 cup of heavy cream, and 2 ounces of softened cream cheese. 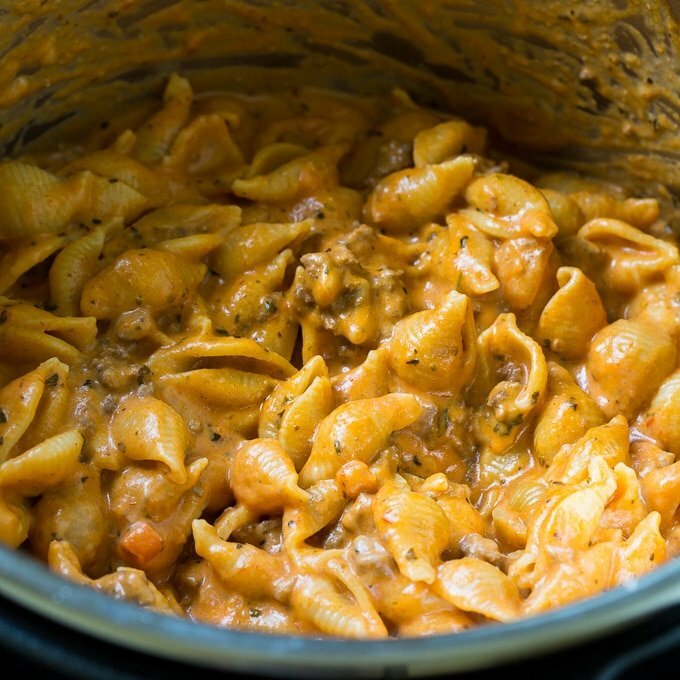 This Instant Pot Creamy Shells and Beef is so easy and so delicious. Your family will be fighting over the leftovers. Pour shells on top of ground beef mixture. Pour pasta sauce and water on top of shells. Do not stir, but press shells down into liquid with the back of a spoon. Place lid on Instant Pot and make sure valve is in "sealing" position. Set to Pressure Cook on HIGH for 5 minutes. Do a manual pressure release and when the pin drops, remove the lid. Stir in Parmesan cheese, heavy cream, and cream cheese. Serve. This entry was posted in Instant Pot and tagged ground beef, pasta. Bookmark the permalink. What is manual pressure release?? Does that mean I let it do it on its own like a natural release? Or does manual mean quick release?? Manual is the same as quick release. I added fresh sliced Baby Bella’s to mine. All I can say is BAM!! Can’t wait to make this tonight!! I had 2#s of ground beef that had to be used up so I put all of it into the recipe but the only thing I truly doubled was the cream cheese. I used 1 onion and stayed with the same amount of pasta, tomato paste, spaghetti sauce, and water. I added more seasonings though since I used more meat . I have a Crockpot brand instant pot so set my time to 7 min just in case. Then went back to work and I lost track of time until it was about 11 minutes after but the pasta was still perfectly al-dente after I opened it. Great flavor! Thank you!! Any idea the calories on this? Has anyone tried this without the cream cheese? What can I use other then Cream Cheese? You could use a little sour cream. Followed the recipe as written. Did forget to the scrape the bottom of the pan, so we got the burn error. Was very good! I used an 8Q IP. Followed recipe but added 2 mins as other suggested. Pasta was still undercooked. I might do 10 mins total next time. I didn’t get the burn warning; however, it was JUST slightly starting to burn when I opened the lid. Glad I opened it when I did. Great taste, though. I made this with penne instead of shells, and added some extra cheese (I’m from Wisconsin, what can I say) and it’s heavenly. I will definitely be making this again. Can this be made with gluten free pasta? I found this recipe when we got our instant pot 3 months ago for our wedding. I saved it and just came across it again today. Amazing! Great flavor and so creamy and delicious. Can’t wait to make it again! Made this exactly as written and it turned out delicious! I’d love to make it again but since I’m only cooking for two I wanted to only make a half recipe. Would I adjust the water and/or cooking time if I cut all of the other ingredients in half? Thank you! I always cook for my 7 year old son and myself. When I make dishes like this, I freeze half of it for a quick dinner later. Just a thought! Delicious! I’ve made it twice since Christmas (when I got my 8 qt. Pot). I skip the red pepper flakes and follow the rest of the recipe and it has turned out perfect every time. We are having a great time with our Pot – it has really changed up our options, especially during the week. Thanks for the recipe! This was good! I did find it a bit spicy, so I will cut the red peppers by half next time. And as others have said, increase the cook time by 2-3 minutes. My noodles were still hard the first time. This was good! I would, as others have suggested, increase cook time by 2-3 minutes. I did find it somewhat spicy, so I would cut the peppers by half. My children ask for this several times a month. Thanks! sautéing the meat, so it’s not that. After I saute the onions and the hamburg and add the seasonings, I deglaze with a little bit of the water. This removes any of the burned on bits on the bottom of the pan. I’ve made this several times now, and it always comes out perfect…knock on wood! This was a hit. We enjoyed it. However, like many have mentioned, the “burn” notification came on. Would be interested to know if others who got it were able to fix the issue if they made it again. Wonderful! I made it with 2 pounds of beef and all the rest as written. And put timer on 6 minutes. . This will be a regular dish now family loved it and it was so easy. Next time tough I may use half beef and half Italian sausage for a hint more flavor. I’ve made this several times. It’s one of my favorite Instant Pot dishes. Love it! Could eat it every week. It’s rich, creamy and very easy. Add a salad and garlic bread and it’s a great dinner. Very good! I did get a burn message and the ground beef part was sticking. There was plenty of liquid in the pot so I’m not sure why? I have an 8 quart so maybe needed to add more then 3 cups water?? Either way it tasted great and very easy to make. I made this dish and it was very good. Almost like lasgna without all the cheese, but I liked it a lot because it was very creamy. We will definitely be making this again! I always make my own pasta sauce and didn’t want to cook something separate on the stove so I altered the recipe just a bit. I sauteed the meat in the pan and added the tomato paste and spices as called for, deglazing the pan with the tomato paste. I added the pasta (whole wheat) and then I placed all of the ingredients for my homemade pasta sauce on top (pureed crushed tomatoes, more Italian seasoning, onion and garlic powder and more salt and pepper.). I added the 3 cups of water, plus a bit more to clean out the tomato from the can. While I did receive a burn notice, I knew there was plenty of liquid in the pot so I just let it continue to cook. To my surprise everything was just fine when I opened the pot after the quick release. There was a bit of meat and tomato paste getting a little burnt/stuck to the bottom but after a good stir you could not tell it all mixed in and didn’t effect the flavor. I think my meat and tomato paste was a bit thick and needed more moisture at the bottom so I plan to try that next time and see if that helps. However, I would suggest to just continue cooking if you know there’s enough liquid (3 cups should be plenty) because your dish will still finish. It made me nervous since this is only my 3rd Tim to cook in the instant pot and I didn’t know what would happen. Very happy with the end result though and I hope this helps some one else. A friend told me about this recipe when I was searching for something to do as my first IP attempt. It was so great! The whole family loved it! I followed the recipe exactly. I usually don’t take the time to leave reviews for things but I am going out of my way to say TRY THIS!! I’ve made this recipe probably 5 times and it gets better each time. I use ground turkey instead of beef, substitute chicken stock for water, and go heavy on the seasoning. It is so good!! Quick, easy AND freezes well. You won’t be disappointed. Just made this. Made exactly how the recipe reads. I did add another minute to cook time after reading the comments. It was perfect and didn’t have one problem with the pot like others. I would definitely make this again. How can this be frozen in dump and go fashion? Followed the recipe exactly and kept getting a burn error. I made sure the bottom was scraped. Used Penne Pasta since this is what I had on hand. Also used jar Alfredo instead of the heavy cream and parmesan cheese. Cooked 6 minutes and did 10 min NPR. perfect! Burned. Tried sauté in separate pan and burned again. This recipe turned out wonderful. I decided to pressure cook for 6min though based on previous comments regarding the noodles not being done- worked perfect. I also let natural release for about 12min, QR after to save time and it didn’t change anything with how this turned out. I also used mozz just because it’s what I had. I did this recipe for first time and followed these alternate instructions. Turned out great! This recipe is for an instant pot is there directions for using a slow cooker? Tried this for the first time tonight….my wife and I loved it. The pasta was under cooked after the 5 minute cook time but I didn’t taste it until after the cheese was mixed in. I put the instant pot on “Saute” and stirred it continuously for 1-2 minutes. I then put it on “Keep Warm” and continued stirring for another minute. I turned the pot off and placed the lid on, letting the pasta sit until it was just right. I had to let the pot soak because cheese was stuck to it. I’ll try 6 minutes next time and test the pasta before adding the cheese. This is destined to be a family favorite. Thanks!! Can I double this recipe? If YES, how long should it cook in the IP? If there is anything stuck to the bottom of the pot after you brown your meat you will get that notice. In that case you may have to remove the meat, put the pot on sauté then add some of the water you’ll use from the recipe and scrape the bottom of the pot clean. Then add the meat back in then the other ingredients and cook as instructed. Hope this helps! I made this with garlic and onion pasta sauce. Was so delicious. Sadly there were no left overs for lunch tomorrow. This was my first meal in my Instant Pot and have made it several times since. It’s pretty awesome and so easy. What can I use in place of cream cheese? Hi, you mention a tablespoon of tomato paste in your post, but not in the recipe portion. Is it supposed to be added? Thanks. Thank you so much for catching that! I fixed the recipe. It isn’t really needed, I just like a little extra tomato flavor. It looks so creamy and cheesy! My two favorite qualities of food! I can’t wait to try it. I made this tonight in my instant pot, initially the shells were a lil hard so i put the lid back on and kept it on warm, and wow!!!! What a hit!!! Easy and five stars for sure!!!! i just made it and came out perfectly. I used a different type of noodle since I didn’t have shells handy. Crowd pleaser and good left overs. comfort food. I’m going to make this tonight without an instant pot. I’m nervous about the outcome, will it cook the same. ? Delicious and easy. I used ground turkey instead of beef and spiced it up with red pepper flakes. Did the noodles end up getting really soft? I’m an al dente sort of noodle lover. I just followed the recipe minus the 3 cups of water….cooked the pasta separate. Would this work with milk or 1/2 & 1/2 instead of heavy cream? Just made this in my instant pot…it is so easy and tasty! I don’t own instant pot yet but this recipe looks delicious! How can I make it without a instant pot? How can this be made without an instant pot? It can be made in a regular pot just fine. Just be vigilant for burning, as it goes south quite quickly. However, it is just as delicious. I have an insta-pot but not with pressure cooker option. What setting and how long?? Thank you! I could be wrong so I hope, if i am, someone will chime in. On my instant pot duo it’s the “manual” button in place of the term “pressure cook”. Hope this helps 🙂 I had to search through videos to find this out since the manual isn’t very detailed in explaining. I have the crock pot pressure cooker/slow cooker combo and it suggested using the beans/chili option and set your pressure to high or low and set the timer. Hope this helps! I just tried this recipe tonight—still in the pot actually. Noodles didn’t cook at all after the initial 5 min time, so I turned it on for another 5 min, and am doing the natural release as I’m assuming that’s what manual release is, because the other option is Quick Release. We’ll see how it turns out!